Users want information that best serves a need and a major part of this is to do with advanced local searches or hyperlocal searches. We have covered extensively the importance and indeed the shift towards a Mobile-First environment and how this is perhaps the most significant development in recent years. With the time poor, information rich nature of the users searching habits it is no surprise that they are using both mobile search and local search more frequently. Google has adapted to this and over the last few years paid particular attention to how searches with hyperlocal intent are displayed and, indeed, ranked. From a consumer perspective, the very reason that a search is conducted is for research purposes. Buyers want answers and access relating to where, how and when they can purchase and that doesn’t change whether they are buying a coffee or a car. According to a report by Forbes Insights customers still like to do their research online but make their purchase instore (N.B. this is changing and will continue to do so). In their study “A Split Screen: Online Information and a Human Touch,” customers prefer to mix technology and in-store visits for major purchases. It also found that nearly 50% of retailers surveyed said that their customers are looking for an ‘omnichannel’ shopping experience. In terms of those using a search engine prior to buying and choosing where to buy from the number is 82%, which shows the sheer power of being at the top of SERPS for your most relevant and your industry’s most competitive keywords. 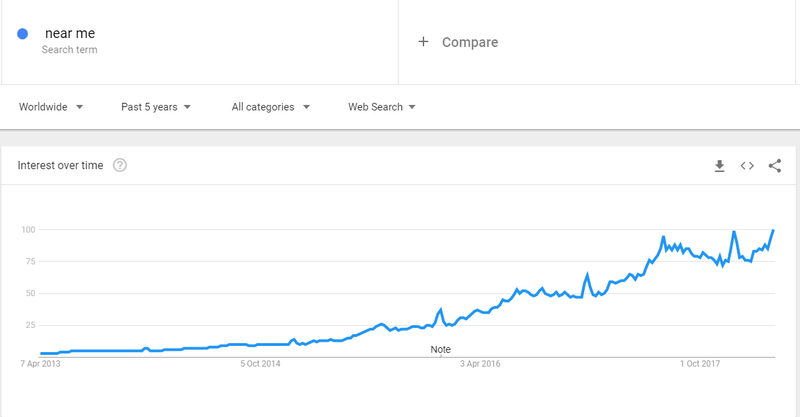 This search for ‘coffee near me’ is on an upwardly mobile curve and this directly correlates with the idea that mobile search and local search have been given a greater level of importance over the last five years. 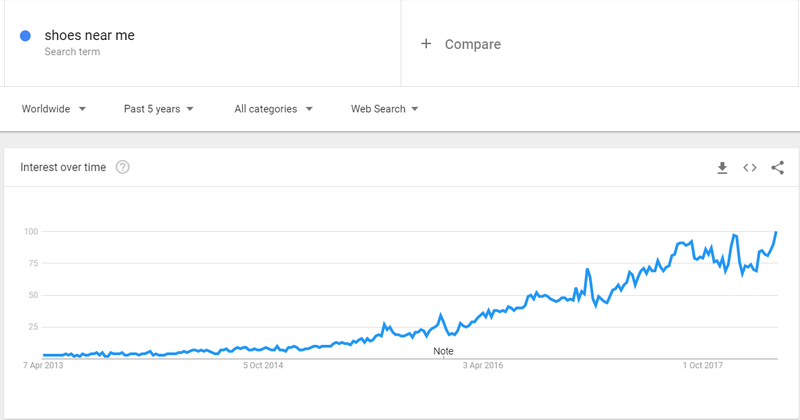 This phenomenon is sure to continue and, in reality, I’d say it’s highly likely that instead of being one way of conducting a search I feel it will become ‘the way’ to search and with Mobile-First finally being announced in March 2018, the shift will continue to turn this from a mobile marvel to standard practise. Google has acknowledged that insofar as the has the following to say: “Across our client base we are still seeing more than 50% of the traffic from these queries coming from desktop — and more than 80% of the clicks but there is a shift”. Trying a different search, this time for ‘shoes near me’ the results are very similar (see below) and simply looking for ‘near me’ also shows the upward trend. 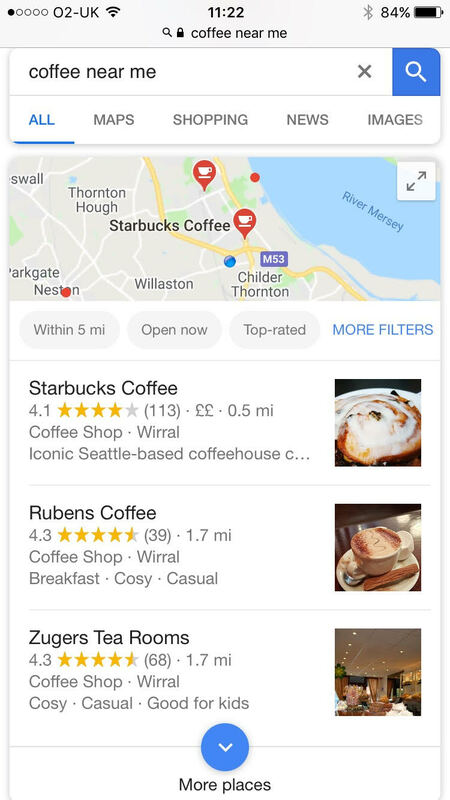 If we also go back to the search relating to ‘coffee near me’ you can pull some additional data and see related topics and queries which can help you to build out your keywords strategy. 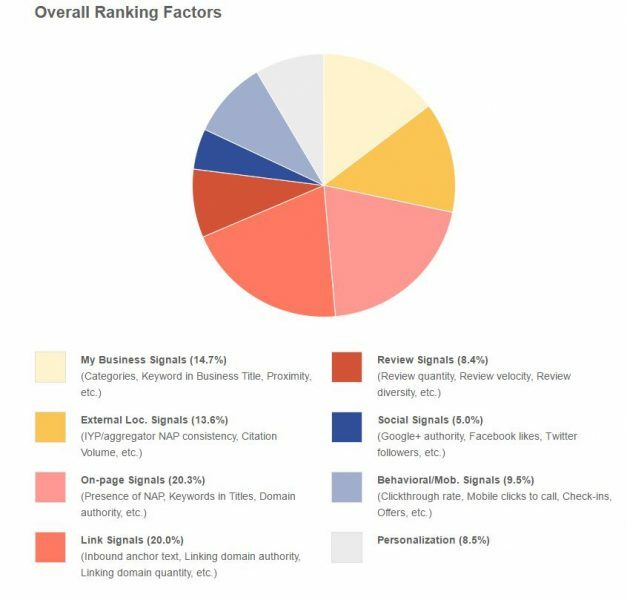 What are the ‘near me’ ranking factors? ‘Near me’ queries as a whole are a relatively small (but expanding) part of local search volume, but these searches are clear signals of local intent and consequently represent high-quality traffic for businesses targeting locally. One area where there was a differing of opinion in terms of ranking factors was in relation to distance as a search ranking. 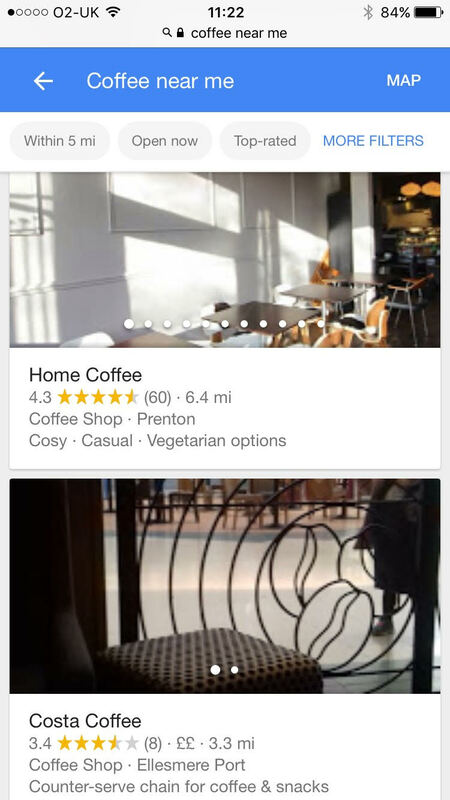 The search below shows a selection of coffee shops near to the searcher. These are sorted apparently by distance. Yet when you expand the results in the second image the distance does not become the natural order proving that although it is the primary factor for the users it is not the primary result that is displayed. Indeed it appears as though the GMB ranking carries more weight. With a log in/sign-up page that promises to help you ‘Manage’, ‘Connect’ and ‘Understand’, Google My Business seeks to be a hub for a number of Google’s small business products including (but not limited to) local listing info for maps, Google reviews, ‘Insights’ and the latest addition ‘Website’. The platform (not to be confused with Google Business Solutions) is a good starting point for any start-up looking to hit the ground running. By signing up to Google My Business you can tell Google directly the name of your business, the exact location, what it does, opening times, what it looks like (upload your own images), and many more attributes. In order to view performance in a hyperlocal environment GMB also offers a huge amount of data in Google Analytics, so you have the stats to back up the strategy. Not only does Google My Business make it easier for it to know what’s what about your business, it also improves the search experience for your customer – giving more ‘at a glance’ information than the traditional SERPs listings do. What’s more the service is free to use. Reflect hyperlocal terms in your on-page content – An important aspect of local SEO is ensuring that the copy across your website is high quality and extensive. In the case of local SEO, this must be the case on all local pages on your website. Location-specific landing pages should ideally be 300 words in length and include information about the local area. If you have multiple local pages on your website, you have to ensure that each page has unique content. A top tip from searchenginewatch on this is that if you are located near a well-known place or landmark (university, sports stadium, monuments etc.)? It might be worth reflecting this in your onsite content. Please use schema markup – When optimising your website for local SEO, it’s critical to optimise your website with semantic markup. 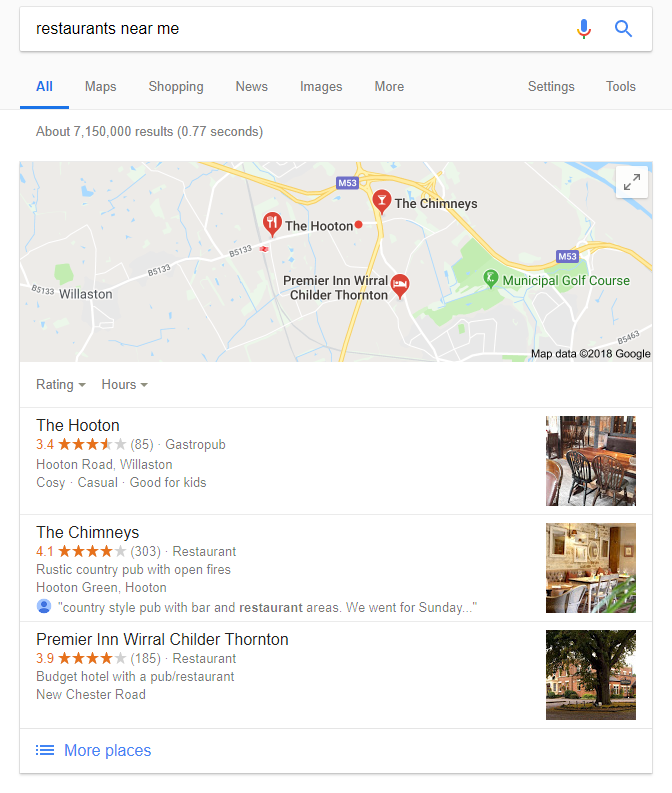 For local businesses, the markup of important information such as the business address, telephone number, opening hours and map data is important as it allows Google to understand the context of the information shown on the page. It might also be worth noting that if you have multiple locations then make sure that you make landing pages for each of the sites. This will maximize your appearance in search and allows you to optimise the content further. Although there are many businesses that feel the reason that their organic performance has improved is because it is in line with their increase in PPC spend, we have to say that this is a myth. The correlation is not proved but that doesn’t mean that it shouldn’t be a consideration in your strategy especially in terms of Google Maps and branded pins. Branded Pins are the next stage of mobile marketing, incorporating Google’s highly used Google Maps. Advertisers have the opportunity to display as a ‘pinned’ location on the map. This is perfect for such moments as when a consumer looks up directions to a meeting, allowing available coffee shops to advertise en route. When touched, the pin expands to provide the user with all the key information a mobile user would need: directions, address, phone number, opening times, in store promotions and product inventory searches. This connection is the strongest so far made available between the digital and the physical in terms of marketing. By combining such features with the developing ‘store visits’ metric, marketers will now be able to begin to quantify the effect of these features. When it comes to this form of geotargeting there are also benefits in terms of PPC not just SEO Google, Bing and most display networks support geomarketing and are able to serve ads to the user based on their location. 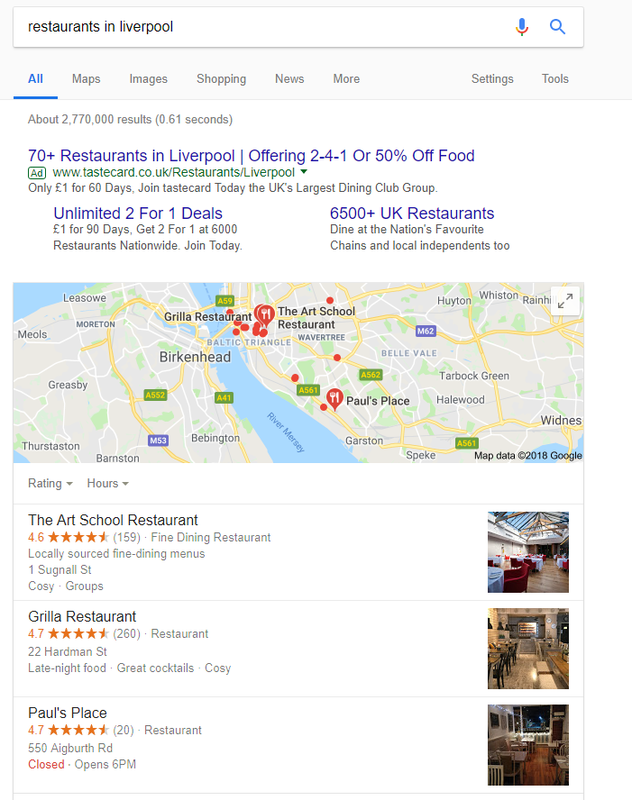 If the search conducted is for an Italian restaurant then future ads for similar restaurants can be served based on where the device is connecting from. Businesses can also use location as a type of remarketing/retargeting strategy. To do this, businesses can use indoor proximity systems. These devices use Bluetooth technology to communicate with nearby mobile devices. This type of technology could benefit stores, events, or any other kind of local business that wants to communicate with its customers in real time. It allows these businesses to gather insights while highly personalising the content based on their shopping or event-going experience. Keeping the message focused on the incentive can attract people and help to create loyal customers in the process. Reach out while your prospect is attentive – Hyperlocal Social Monitors can act as both active and passive method of communication. If a user posted a Tweet online, there is a small time frame (approximately 2-3 minutes) where the user is expecting a response, voice, or an opinion to that post. If retail firms respond within that window, they’ll receive the full attention of the customer. The response must provide a call to action, or build a conversation. Personal triumphs vague – Marketing is effective when it is more personalised and relevant to the area in question. Build a more intimate relationship between the brand and the customer. Targeting social influencers –Hyperlocal Social Monitors provide necessary tools and features that will provide deeper insight into the social media user or customer. Rewarding influencers will be the simplest and best way to reach out to new local customers and empower the brand locally. Point of sale is key – Customers use social media to reach out to the world to receive an opinion of what they wish to purchase. Encouraging purchase, through sharing the sales for that day, or reward points received. Customers are not always aware of great deals, and for them to be informed will increase UX. Measure success – Few Hyperlocal Social Media tools provide the functionality that enables businesses to measure the success of their social media strategy. Combining social media data (sentiment, influence, reach) with retail metrics, means it is now possible thanks to cross-platform technology – such as APIs and cloud technology to get the best results and adapt your strategy. When it comes to the impact of adopting this kind of strategy has on your business is quite clear. Smallbiztrends said: “You already know that location is paramount for local businesses. But it isn’t just your storefront’s location that can make a big difference to your business’s success. Location can also have a big impact when it comes to your market research efforts. This sums it up nicely. You need to be an adopter if you haven’t already, you need to be. Look and test different strategies if you are to attract not only those who are directly in your area but those who are passing by. These impulse sales can mean big profits and the ROI of a hyperlocal strategy is not to be sneered at. With a Mobile-First, local search strategy you may also intercept potential sales if you can target those in an area close to a rival company. In the future I’ll look at producing a whitepaper on this sort of strategy and will look into the businesses that are best served by moving forward with this approach. Click Consult are committed to staying ahead of the curve, if you want to see what we can do for your brand, contact us today.